The spring semester BFA, MA and BA series of exhibitions are a celebration that both graphic design and studio art students anticipate and prepare for throughout their college years. 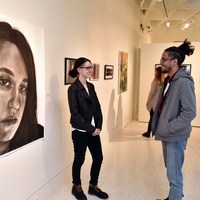 Continuing the high standard expected of Oswego art graduates, each student presents a selection of work as part of their degree requirement. Designed and installed by the students themselves, a multitude of artistic media as well as conceptual approaches are represented.